1) I was tasked to do the RootsMagic class at the San Diego Genealogical Society 9 a.m. hour on Saturday. 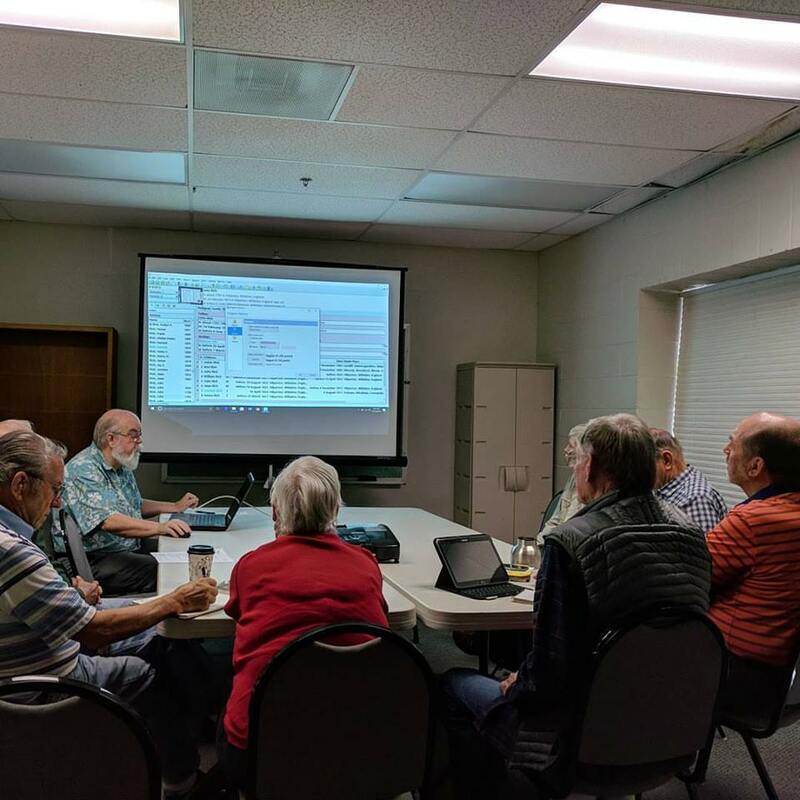 I do it in November since we can't have our monthly RootsMagic User Group meeting at the FamilySearch Library on the 4th Saturday - it's Thanksgiving weekend. We had 9 in attendance for the class, 4 of whom were beginners, four who were intermediate users, and myself. They told me what they were concerned about, so we touched on GEDCOM files, the Views, editing persons, adding sources, adding media, the menus, file and program options, TreeShare and WebHints. I didn't get to the Help file and FamilySearch Family Tree operations. I probably forgot some other important tasks too. 50 minutes is not enough time! 2) We had our monthly Chula Vista Genealogical Society Research Group meeting last Wednesday, and had 18 members in attendance. I couldn't use my laptop because the Wireless Adapter crapped out, so I tried to use John's laptop, but it wouldn't connect the screen to the projector. So I used Gary's laptop and that worked fine. We wasted 20 minutes. In what was left of my hour, I discussed the A.J. Jacobs book, MyHeritage passenger lists, the English GRO PDFs, the AncestryDNA Story feature, the new Find A Grave look, RootsMagic TreeShare issues, and my Genealogy News Bytes posts. In the second hour, the attendees discussed the DNA test bargains, different user DNA experiences, the Finding Your Roots episode, Mexican church records on FamilySearch, a Historical Society visit, and lessons learned at society meetings - write everything down, share it with others, and work to solve the brick wall problems. 3) I checked my autosomal DNA matches on FamilyTreeDNA and used the "In Common With" tool for the first time. Not every FTDNA tester has a tree on FTDNA, and not every tree has a lot of leaves, unfortunately. I figured out that I need to download my matches and try to identify the common ancestors if possible. 4) The number of my AncestryDNA matches with "Shared Ancestor Hints" has decreased from 245 to 231, probably due to people selecting more privacy. I'm guessing that most of them are those without Ancestry Member Trees who only want to know their ethnicity. I check this weekly, and make notes on the new matches and add the common ancestors to the notes if possible. For those matches without trees, I check the "Shared Matches" list to try to identify the probably ancestor lines from the known "Shared Ancestor" lines. . For most of them, I cannot identify a common line. I need to make a spreadsheet for these matches also. 5) An email came in which had a photograph of a relatively young (age 30-40?) Cornelius Feather. I have three in my RootsMagic database, all in Pennsylvania. My 4th grandfather died in 1853, so it's probably not him. Another died at age 18 in the Civil War. The third one was born in 1836 and died in 1873, and had several children. The owner of the photo had other photos in the same "batch" for "Uncle John" and "Uncle Jim." I found one family with grandchildren of Cornelius A. Feather named John and Jim. I think the original owners of the photos were one of the other children of this Cornelius, because her husband died where the emailer resides. I need to do more research here. 6) Another emailer has Seaver ancestry, and would like a report to provide to her descendants. I created a 50 page PDF for her ancestors, but haven't sent it yet pending more information from her about the descendants. 7) We had a lively Mondays With Myrt hangout today - see the video at http://hangouts.dearmyrtle.com/13nov2017mwm.html. We discussed Find A Grave, GenealogyBank, marriage banns, online newspapers, Facebook genealogy, one-name studies, message boards, Mayflower passengers, and more. It will be on DearMYRTLE's YouTube Channel soon. 8) Mixed in with all of the above is blogging, reading and working on my RootsMagic database. I added quite a few descendants of my 5th grandparents to the database, doing a TreeShare, getting Ancestry WebHints, and adding sources and notes to those entries in RootsMagic. I then add the updated content to FamilySearch Family Tree.